Can the occupation and self-management of factories constitute a viable solution in Europe, not only to growing unemployment and poverty, but also to the very exploitation and alienation that lie at the core of capitalist production? Fralib is a herb processing and packaging factory located 20-odd kilometres away from the southern French port city of Marseille. The previous owner of the factory, chemical and agri-food giant Unilever, decided 3 years ago to move production of Lipton tea abroad to save on labour costs. The 80 workers, through protest and boycott campaigns, have demanded that the factory stays open and, after this proved impossible, they decided to take production into their own hands. They have recently restarted the machines of the big factory to produce a test batch of linden tea based on local produce, and they are currently looking for ways to restart production in full capacity. It is one of a handful of European factories that, with or without a radical or transformational discourse, have moved towards workers' self-management of production. The occupation of businesses by workers and their democratic management through horizontal decision-making processes is a centuries-old practice, that has however reemerged around the turn of the century -most prominently in Argentina, where currently there are about 300 workplaces "recovered" by about 15.000 workers. Can this model also constitute a viable solution in Europe, not only to growing unemployment and poverty, but also to the very exploitation and alienation that lie at the core of capitalist production? 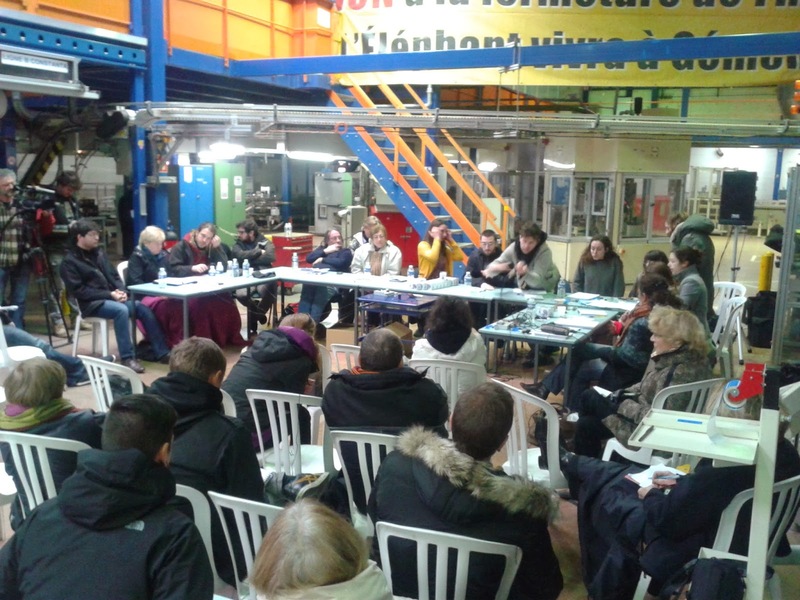 This was the main question that the first European “Workers' Economy” international meeting, held on January 31 and February 1 at the occupied factory of Fralib, tried to address. The idea behind these independent and self-funded events was born 7 years ago in Argentina, with its 2-decade long tradition of factory occupations. Soon after similar events were held in Brazil and Mexico. 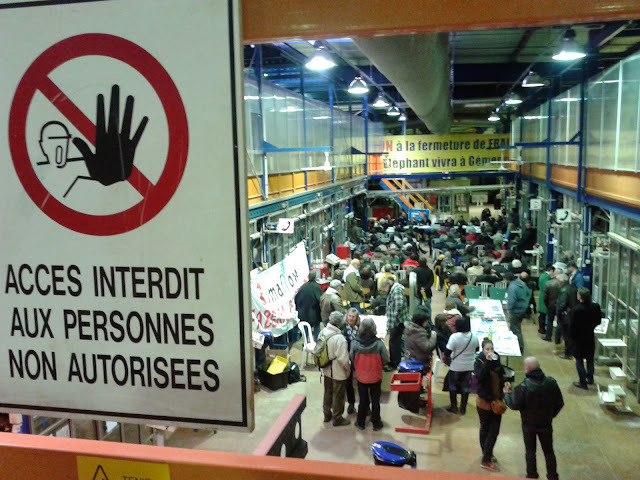 This first European edition of the gathering brought together not only workers of the self-managed occupied factories from around Europe, but also academics, activists, trade unions, and organizations that promote and study self-management, such as French Association Autogestion and Spanish ICEA. About 200 people coming from a dozen of countries attended a complex event held among the blinking lights of the tea packing machinery of the company. Parallel translation to 3 languages, carried out by activist-translators' volunteer network Babels was instrumental in bringing down the language barrier and joining together so many different and geographically distant experiences. 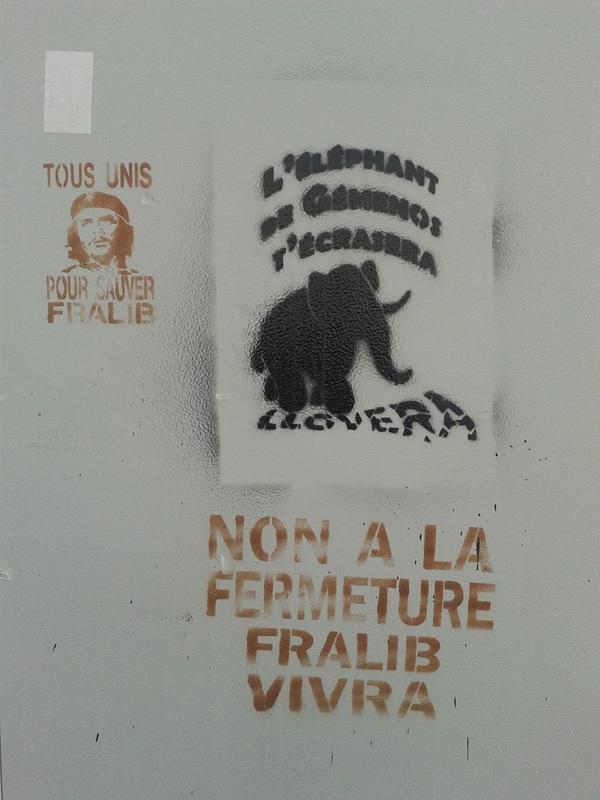 Participants, apart from hosts Fralib, included Pilpa, an occupied ice-cream factory from Carcassone, France; Officina Zero and Rimaflow, two ex-industrial spaces occupied by their workers and other activists in Roma and Milan respectively; and VioMe, one of the few self-managed experiences so far to have achieved a stable -although limited- income for the workers, through the production of ecological detergents in their occupied factory in Thessaloniki, Greece. Another guest, an Argentinian worker of the Pigüé textile factory, tried to draw parallels between the early stages of the movement in crisis-stricken Argentina and the nascent European movement. Many more experiences in workers’ self-management and cooperative economy were shared from places as diverse as Serbia, Spain, Mexico, Venezuela and Brazil. Although the will to democratize production and redistribute wealth “is in the DNA of workers”, as Andrés Ruggeri, militant Argentinian researcher and one of the main promoters of the event, pointed out, experiences of factory occupation and self-management are as diverse as the political, economic and historical contexts they take place in. Often the workers have to deal with a production unit that is obsolete or produces products that do not have demand (this is the case of Officina Zero). The inventiveness and creativity of the workers in these cases, and most importantly their close cooperation with the wider community, can help reconvert production towards more useful and environmentally sound products. In the case of the Italian factories, this reconversion will permit, among other activities, salvaging and recycling electronic equipment. Common challenges faced by occupied factories include state repression, huge bureaucratic hurdles, lack of institutional framework, and the hostility of the ex-owners, political parties and bureaucratic trade unions. They often operate within economies that are already in great recession (such is the case of VioMe and most Argentinian factories in the early 21st century) and thus re-entering the market and ensuring an income are tough feats to accomplish. Dangers also lie ahead in the case of economic success. How can the workers safeguard the radical character of the experiment and avoid becoming an “alternative” multi-shareholder capitalist enterprise guided by the profit principle or using wage labour? In answer to that, many participants pointed towards the close relationship with the wider community. It is not sufficient for production to be worker-controlled, although it is a necessary first step to break the vicious circle of capitalist exploitation. Production should also be socially controlled, it should be environmentally and politically sound and grounded on the values of respect and solidarity. The workers of VioMe echoed these concerns when they announced that, in the statute of the upcoming cooperative that is aimed at legalising their activity after their first anniversary of workers' self-management, they recognise the figure of the “solidarity supporter”. This is any member of the wider community that commits themselves to consuming a certain amount of products of the factory, and in exchange has the right to have first hand information about the struggle, participate in workers' assemblies, and help in decision making through an advisory vote. A bridge is thus built between workers' and social control of production. Apart from an exchange of ideas and experiences, many concrete projects were set in motion in this first European meeting as well. Workers, activists, academics and supporters initiated campaigns of promotion of the products of self-managed factories, agreed on direct exchange of goods between factories, put in place instruments of networking and collective decision making, and elaborated projects that advance theoretical understanding of self-management and promote popular understanding of the issues surrounding it, such as the web page workerscontrol.net, a multilingual resource dedicated to the study and promotion of self-managed workplaces. There was even mention of a solidarity fund created out of any surpluses that the occupied factories might have, which will provide funding for new endeavours and will thus help cut the ties with the capitalist financial system. When it comes to creating a humane economic activity based on equality and solidarity, there are no predefined rules. The workers' imagination and their will to struggle for a better world are the only limits. The “Workers' economy” event at Fralib was inspiring and empowering for everyone involved, and it might well have sparked the creation of a Europe-wide movement of occupation of the means of production and of workers' self-management.